With rude wit and raw emotional force, an impressive first collection depicts the complex and combative interrelationships of three Chinese-American families. 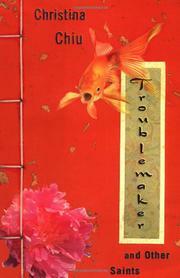 Eleven linked tales comprise a round-robin assortment of vivid glimpses of cultural and generational displacement and conflict, in both America and Hong Kong (at around the time of the “Handover,” marking independence from Great Britain)—beginning with the story of racially mixed teenager Laurel’s struggles with her reputation as a high school “Nobody” and ending (in “Thief”) when her boyfriend bungles a cat burglary during their Asian “vacation.” The intervening pieces focus in turn on such variously troubled characters as Laurel’s physician Georgianna Wong, married to a black man and burdened by her family’s old-world attitudes and imperatives (in the brilliantly constructed “Doctor”); a conservative “Mama” quietly attempting to arrange a marriage for her headstrong “bi” daughter (“All her life she’s had too many choices”); and a promiscuous “Beauty” who looks for excitement, if not love, among the personals ads, and sees herself with stunned clarity when her cousin’s brutal fiancé accosts her. The sense of traditional ways of behavior disintegrating and of families helplessly poised at one another’s throats gathers tremendous power, as Chiu weaves gracefully among her characters’ several stories. The pressure, for instance, that a high-speed new international economy exerts on fragile marriages and other “arrangements” is dramatized crisply in “Gentleman” and “Trader”—while the unforeseen consequences of ever-widening rifts between parents and children generate revealing drama in the story of a teenaged “Troublemaker” whose impulsive act of violence brings him eventually to a sobered encounter with a world far larger than any he has imagined, and especially in “Copycat,” where the “losses” of one child to suicide and another to Buddhism underscore the fragility of a truly “mixed” marriage. Wonderfully involving and intelligent work, from a strikingly gifted new writer.